(2) Abbott “Architect C8000” ICT Module Chemical Analysis Systems s/n’s 140218071, 131105050. Olympus Medical Gastrointestinal Video Endoscopy System w/ Olympus CV-140 Video Processor, Olympus CLV-U40 Light Source, Monitor, Cart. Olympus Medical Gastrointestinal Video Endoscopy System w/ Olympus CV-140 Video Processor, Olympus CLV-U40 Light Source, Samsung DVR, Sony Mavigraph Color Video Printer, Monitor, Cart. Olympus mdl. GIF-N180 EVIS EXERA II Gastrointestinal Video Scope. Olympus mdl. GIF-130 Flexible EVIS Video Gastroscope. Olympus mdl. EVIS OVC-100 Fiberoptic to Videoscope Converter. Mortech Mfg. Stainless Steel Anatomy Dissection Table. SMD-40 Laser Engraving System s/n A.36 w/ YAG-Laser. Custom PLC Controlled Glue Applicator. Reactor, Storage and Transfer Vessels Mueller 6000 Liter Stainless Steel Pressurized Jacketed Reactor Vessel w/ Multiple Ports and Agitator. Precision Stainless mdl. RT-4 2500 Liter 316L Stainless Pressurized Jacketed Reactor Vessel s/n 9820-2w/Lightnin Agitator. 2013 Feldmeier 316L Stainless Steel Pressurized Jacketed Reactor Vessel s/n S100812 w/ Multiple Ports. DCI 980 Liter (259 Gallon) Stainless Steel Pressurized Jacketed Reactor Vessel w/ Agitator Port 46” Dia. X36” High. (2) Precision Stainless 600 Liter 316L Stainless Steel Pressurized Jacketed Reactor Vessels w/ Wheels. (2) Mueller mdl. F 1000 Liter Pressurized Jacketed Vertical Stainless Steel Vessels. 2002 Feldmeier 490 Liter 316L Stainless Steel Vertical Pressurized Jacketed Vessel w/ Ports. 1540 Liter (407 Gallon) Stainless Steel Transfer Tank w/ Wheels 48” Dia. X 52” High. 1089 Liter (288 Gallon) Stainless Steel Transfer Tank w/ Wheels 48” Dia. X 48” High. 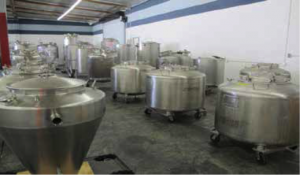 (7) Letsch 190 Gallon 316L Stainless Steel Pressurized Jacketed Transfer Vessels w/ Wheels. Sprinkman 421 Liter (111 Gallon) Stainless Steel Transfer Tank w/Wheels 332” Dia. X 32” High. Utensco Vertical Stainless Steel Process Tank s/n 4546. TSI 200 Gallon Stainless Steel Process Vessel s/n 5527-06. Feldmeier 490 Liter Stainless Steel Solution Vessel. 2010 AZO Type Behalter 800XD205X1256H Stainless Steel Hopper s/n 2800677. (2) 2006 MaxMove Ind Type MAXI75V Scissor Platform Lifts s/n’s 2415, 2416 w/ 441 Lb Cap, 290” Lift Height, Motorized Platform Extension. 2006 MaxMove Ind Type MINI61 Scissor Platform Lift s/n 5208 w/ Motorized Platform Extension. (4) 2004 MaxMove Ind Type MINI61 Scissor Platform Lifts s/n’s 5206, 2505, 5203 w/ Motorized Platform Extension. Bishamon 6500 Lb Cap 30” x 63” Portable Hydraulic Scissor Lift Table. Cart Caddy mmdl. 5W 36 Volt Electric Cart Mover s/n 307274. (8) Custom Stainless Steel Vessel Transfer / Pouring Carts. (2) Ingersoll Rand 500 Lb Cap Pneumatic Hoists. Stainless Steel and Aluminum Platform Ladders. 2010 Gettinge mdl. GEW P666-1 Washer s/n 9U100060 w/ Allen Bradley PanelView 1000 Digitalontrols, Mettler Toledo Thornton M3000 Conductivity Resistivity Controller, Chart Recorder, 27”W x28”H Opening. 2000 U.S. Filter mdl. 100-M- 30-37-PF1.0 Type-Manual Stainless Steel Filter Press s/n 22296 w/ Power Team Hydraulic Unit, Filters. 2005 Resolute 35cm Chromatography Column s/n 800-V- EP5555 w/ 4.2 bar g Design Pressure, 50.3 to 150.8 Liter Volume, Stainless Steel Rolling Stand. Oxford Instruments mdl. 7T FTICR Magnetic Environment Chamber 558L – 147 Gallon, 34” Dia x 37 ½”Long. Purified Micro Environments / Germfree Laboratories mdl. AES2X4FFU and AES1X2FFU Air Filtration Units w/ Rolling Stand. TSI Todd Street Inc. 132 Gallon Stainless Steel Bath s/n 5605-06 w/ Lid. Stainless Steel Agitator Mixing Blades. Viking Stainless Steel High Volume Pumps. Frisrtam 5Hp to 15Hp Stainless Steel Centrifugal Pumps. AlphaBio Stainless Steel Centrifugal Pumps. Ohio Oscillator 19” Stainless Steel Gate Valve. InterAP 12” Electric Gate Valves. 12” Motorized Stainless Steel Gate Valves. Misc Motors and Pumps to 40Hp.